Patio gardening is the easiest way to get into gardening. It can be as simple as buying a hanging basket or patio pot and watering it. - When the temperature is over 80 or on windy days, all pots will have to be checked daily. - When the temps get over 100, a wilting plant may not need to be watered. Stick a finger into the pot, if the soil is wet check later. -Begonias, Hydrangeas, Hostas, Ferns, and Japanese Maples are well suited to pots in shady to partial sun spots. -Never buy a potting soil with fertilizer already in it, they are never in the right proportions for any plant. -Potted plants need supplemental fertilizer. Apply a slow release as soon as possible to prevent burning in the heat of summer. 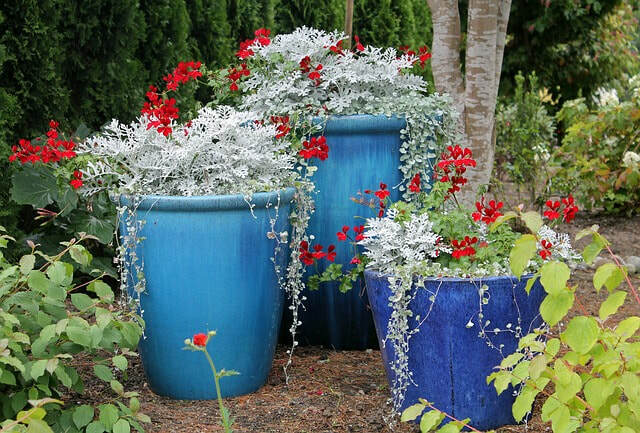 Adding an attractive pot to a garden is an easy way to add height and seasonal interest.